Good evening felinity assembled! Elvira Mistress of Felinity, here, with some interesting and cool, news. As friends and fans know we have picked up a few awards over the years...though the last one was over 3 years ago. We have also been praised more than a few times over the years, the most recent being last Spring. Imagine my surprise when Daddy Kiril and I checked our email, this past week, and found 2 interesting notices. A lot has happened since Summer 2012, when Daddy Kiril finalized a move to Houston, and Sept. 2012 when he Mr. Nikita and I got here. This is an effort to celebrate our time here on this anniversary. This post, co-written by Daddy Kiril and I, Elvira Mistress of Felinity is meant to celebrate 4 years of cat blogging by The Opinionated Pussycats. 1. Creativity means celebrating 700 blog posts by packing up the cats and everything else and moving to Texas. 2. Creativity means Nikita and Elvira exploring their new home on a leashed walk. 3. Creativity means 4 years of sharing photos of cats and other critters via Street Seens and Seen & Heard posts. 4. Creativity means the cats getting used to their new home, helping Daddy Kiril unpack, set things up and put together bookshelves. 5. Creativity means Nikita and Elvira telling everyone, through images and words about the trip to Houston. 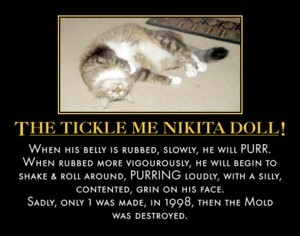 Getting to the airport....Nikita's take on the journey....Elvira's take on the journey. 6. Creativity means Elvira using poetry to explain the move to TX. 8. Creativity means playing nurse to Daddy Kiril as he spends the last couple of months of 2012 and the first few months of 2013 dealing with his eye surgeries (one for a broken blood vessel in the left eye, the other for cancer in the right eye). 10. Creativity means beginning 2013 by joining Daddy Kiril an accepting the Very Inspiring Blogger Award. Bappy Hirthday, Mo, Caretaker of the Cat Blogosphere Website! 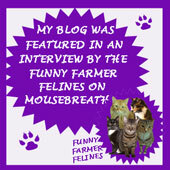 Mo keeps the Cat Blogosphere website going on a daily basis, the most recent of several cat lovers who have done so for many years, posting news of all sorts sent his way from around the cat blogging community and managing the daily linky lists as well! 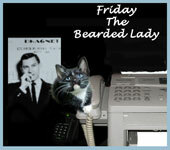 Elvira Mistress of Felinity, Sneakers the Texian Tuxedo and Friday the Bearded Lady join me in hoping you know how much we appreciate you! Hey, everyone, Elvira Mistress of Felinity here! 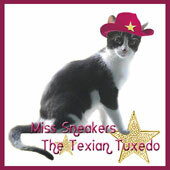 The need for purrs and purrayers is POWERFUL for a dear friend of this blog and of so many pet bloggers, going back a decade, and Nurse Sneakers the Texian Tuxedo (Sorry, no hat for her!) and I call on you to spread the word and visit her blog, Twitter, and her Facebook (if you are a FB friend) to let her know you care. Miss Mog let friends on her Facebook know, late yesterday evening, that she wasn't feeling well after a long day in Urgent Care. "Good thing Mommy is not scheduled to do the carnival. She has been dizzy for a few days and started having arrhythmia. Her daughter took her to Urgent Care. Her Blood pressure was way up, as was her heart rate. They told her her EKG abnormality was indicative of a possible heart attack. We are waiting results of cardiac enzymes. I am worried she may have to be in the hospital." Was it any wonder I was in a tizzy when Daddy Kiril got home from work? 1. Cardiac enzymes came back normal indicating I wasn’t having an acute MI. 3. Will try to see my PCP and get a referral to a cardiologist. 4. Will call ER for advice if needed. I so wish I could be there to relieve Ritzi on LapCat Duty to help Miss Mog recover! She is feeling awful and the love and support of friends and fans will help her mood so very much! 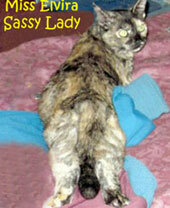 Thank You Ann, of Zoolatry, for spreading a message her cats received from Angel Meowza! Marian Allen is an award-winning author, blogger, and encourager of others who, in July, took time out to award The Liebster Blog Award to several blogs she felt worthy... the Opinionated Pussycat, included. On behalf of Nikita, I, Elvira Mistress of Felinity, wish to humbly say thank you and, at last, respond and pass the award along. But, before doing so a little Liebster Blog Award and Rules History is in order and Daddy Kiril has all the details. The important thing is if you receive the award, you can 1) accept it and 2) pass it along....or not. The original idea didn't include asking and answering questions so don't feel you have to either. If you can only come up with 3 to 5 blogs to pass the award on to, as was the original idea, then don't feel guilty for doing so. You are under no obligation to accept it or even pay it forward if you do. It's that easy. Good morning! Elvira Mistress of Felinity, here. Today is a day for felinity assembled, the world over, to celebrate ourselves! It is World Cat Day! The day was founded in 2002 by the International Fund for Animal Welfare (IFAW) and other animal rights groups. In honor of the day I came up with 4 ways that humans look at cats! Nikita Discovers Lady Cat Considers Him a "Hunk"! When Ceiling Cat made me, he tossed out the mold, we all know that, no need to be modest here, it's just a fact, but, being a guy who was fixed before he ever had the chance to get "hot to trot" with the ladies, the possibility that said ladies, the world over, may secretly yearn for me has mostly gone over my head. Either that or, in my dotage, I'm sometimes forgetful of such expressions of flattery that have come to my attention over the years. Plus, there have no doubt been times I never knew a lady had even swooned! The ladies apparently love me! I still am, though health issues have reduced my weight to just 9 lbs since that photo was taken. Love my form in performing the Full Sun to the Belly kitty yoga technique? 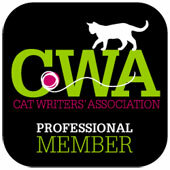 "As a newbie to Blog Paws conferences I admit to being a little nervous but, standing there in the lobby my nervousness soon disappeared as I heard my name called, turned around, & saw Caren Gittleman (Cat Chat); arms open wide, a smile on her face, charging forward to embrace me in a welcoming hug. session in the afternoon, and the welcome speech and get together in the evening, like I’d been coming to the conference since forever." Since returning I have been organizing photos, stash, cards, fliers, and my notes, as well as doing follow-up emails. I do not know where all that will lead, but you won't know unless you DO. So this writer is doing the best he can, trying to learn new things, and make new connections, along the trail of his creative journey. The cats and I have shared all my photos in a 4 part series and I have begun a series that finally share my experience through my notes. Yesterday, Nikita shared an intimate look at the editorial office of The Opinionated Pussycat, the place where all the writing and research that he and Elvira Mistress of Felinity put into this blog takes place. It is our great pleasure and honor to report that that comment was the 3000th one left on this blog since it began on New Year's Day 2010. 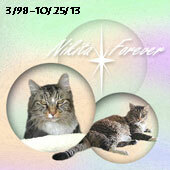 This means a lot to us because we have long enjoyed their work, and proudly display their badge in the blogroll of The Nikita Institute for Feline Studies. Stop by and celebrate the start of summer with Caren & Cody! Thank you Cody, and thank you, Caren, for your friendship with us. A long time ago, in a year far away (2002), a human began to blog. Within 3 years he could not keep from sharing his love for his cats any longer. 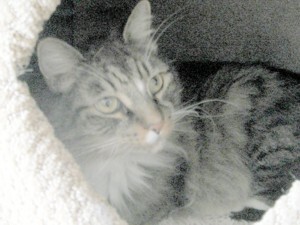 So, this human starting sharing his cats with his readers in March 2005 and, on April fool’s Day, believe it or not, he introduced everyone to a young mancat named Ripley. Donate an item ~ or as many as you would like!